"If you have a sombrero, throw it to the sky!" 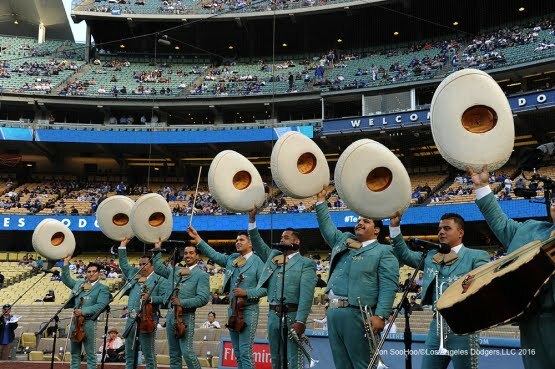 As a part of Adrian Gonzalez's bobblehead night Mariachi Garibaldi de Jaime Cuellarcame out to perform the national anthem before the game. You can see them in the photo at the very top, via Jon SooHoo/LA Dodgers 2016. Their appearance was the start of an festive affair that included an outstanding performance by Scott Kazmir on the mound, an attempted inside-the-park home run by a Reds player that ended with a perfect relay to home to get him out (watch it here), and a welcome sweep at a time when the Dodgers sorely needed it. The Dodgers are now two games above .500. Following up on the sombrero theme, it has been announced that Dodgers left-handed prospect Julio Urias will be called up from Oklahoma City on Friday to pitch that evenings game in New York. Oh Boy! The 19-year old will be the youngest player in the league when he comes in. He'll be taking over for Alex Wood in the rotation, who is currently experiencing arm soreness but is expected to pitch again on Monday. I suspect this will only be a spot start for the kid. Although I have my reservations about bringing the kid up this soon I certainly welcome the opportunity to see what he can do on the big league level. This Day in Dodgers History: In 1971 Maury Wills records his 2,000th career hit against the Giants. In 1996 former Dodger Mike Sharperson died in a car accident in Nevada at the age of 34. He was an All-Star for the Dodgers in 1992. Jon Weisman at Dodger Insider wrote a great story about him today. Check it out here. It is worth your time. Via David Krell at the Sports Post; "The Hall of Fame Case for Tommy John." Via Piazza Parlor; "Run Differential Says Things Aren’t So Bad." Via Andrew Joseph at USA Today; "Dodgers fan falls down stairs and drops so many bags of peanuts." LOL! Via Chad Thornburg at MLB.com; "Ryu goes four scoreless for OKC in rehab outing." Via Richard Deitsch at Sports Illustrated; "Media Circus: Vin Scully declines Fox’s All-Star Game invitation." Via David Hood at True Blue LA; "Chase De Jong shows polish and poise for Tulsa." The bread and butter pitch for De Jong Tuesday night was his fastball. He sat primarily at 91 mph, and ranged from 88-92 mph, in line with scouting reports. The pitch had a slight amount of arm-side tail, but little sink. De Jong pitched primarily up in the zone and had Frisco hitters swinging under the pitch all night. While I won't suggest you can tell this with the naked eye, I suspect that De Jong's fastball has a high spin rate and "rise," with hitters failing to accurately judge the flight path of the pitch. So this happened during a Tulsa Drillers, the Dodgers AA club, the other day. Via Chris Cwik at Big League Stew; "Rangers minor-league manager goes on crazy tirade after ejection." Frisco RoughRiders manager Joe Mikulik is known for one thing. No, it's not his 11-year minor-league baseball career, or the fact that he has a .520 winning percentage in 18 seasons as a minor-league manager. Anyone would be proud of those accomplishments. Instead, the manager of the Texas Rangers Double-A affiliate is defined by something far more sinister. Any time he's ejected from a game, he completely loses his mind.